Today we have a guest article from Nasim Tadghighi who attended historian David Starkey’s talk entitled “Acton Court and the Tudors” at the University of Bristol. Last night I attended a talk by David Starkey on Acton Court and the royal progress of 1535. For those unfamiliar with the place – Acton Court was a grand house in South Gloucestershire. In the 16th century it was home to the Poyntz family, a well established and connected Gloucestershire family. Only one wing of the magnificent house still survives and, wonderfully enough, it is the same wing built for the visit of Henry VIII and Anne Boleyn in 1535. It later fell into disrepair but in recent years it was conserved and is now open to the public in summers. David Starkey is a great fan of the building and uses it frequently in his Tudor documentaries. Most of Starkey’s talk was on context. In order to understand why Acton Court and why Henry and Anne’s stay there was so important, we have to understand the role manor houses played in Tudor England. Starkey drew the audience’s attention to the fact that the English call these buildings ‘houses’ (so ‘country houses’), whereas elsewhere in Europe, including in France, they are castles. They are ‘power houses’ – for they are occupied by those who wielded national or local power. He also pointed out that in England very few people were classified as members of the nobility. The gentry were a larger group and it was a class that anyone who was wealthy, connected and educated enough could aspire to. He pointed out that during Henry VIII’s reign there was an astonishing few amount of dukes – and Henry having the duke of Buckingham’s head chopped off makes them fewer! – but, provided you were wealthy enough, you could become a figure of local importance. The governance of England was not simply based on power in Westminster. Areas were governed by regional bodies. So to be a figure of local importance – to hold power over your area – was really to be someone in Tudor England. He then said that we must not confuse our ideas about households with the 16th century concept. Households, the ‘family’, did not just include the mother, father, children, etc, but everyone within, including servants. Grand 16th century houses were mini towns – and he even looked at places like Hampton Court and identified them as similar in structure to mini medieval settlements. The Tudor gentleman had many servants; the more attendants he had, the more powerful he became. Starkey stressed the importance of household badges, household colours and other emblems, all to emphasise that servants frequently displayed their allegiance to their master and were willing to aid them in anything. And this also meant to fight if their master told them to. England had no standing army in the Tudor period. If the king wanted to go to war he relied upon his noblemen and gentlemen to raise arms and aid him. Finally, Starkey talked about royal iconography in Tudor houses. It was all well for a gentleman to ensure his servants wore his colours, his badge and showed him loyalty, but courtiers relied upon the King’s favour. They owned all to their King, and they did not fail to recognise this. Starkey referred to numerous examples of the Tudor rose, the Aragonese pomegranate, and other royal insignia adorning the finest pre-Reformation Tudor houses. In effect, the master of these households had also become a servant in the same establishment. By pointing out they themselves had a greater master – the King – they were indicating that authority does not stop at them. And it is not just shown in houses. This can be seen in Tudor portraits. Starkey showed us a portrait of Sir Nicholas Poyntz by Hans Holbein (you can see it here: http://www.flickr.com/photos/20631910@N03/3384880787/in/set-72157621694151806/). Sir Nicholas is clearing wearing the gold chain indicating his knighthood – a knighthood obviously conferred on him by Henry (and Starkey forgot to mention that Henry probably knighted Nicholas around the time he and Anne visited Acton). So finally onto the royal progress and Henry and Anne’s visit to Acton! By 1535, Henry was now Head of the Church, married to Anne Boleyn, and their issue were declared the lawful heirs in an Act of Succession passed the year before. So this trip was not just about getting a ‘break’. The Reformation was the main consideration. Anne would be displayed to the public as queen, and she needed all the publicity she could due to her poor reputation particularly amongst women. 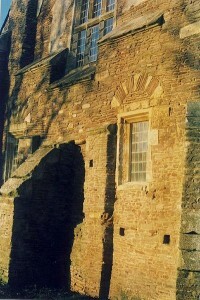 The Reformation is such an important part of the story of Acton Court. Starkey showed us that one of the most remarkable things about Acton Court was the lack of royal iconography. In fact he went further by saying that Acton was the first house to show the political impact of the Reformation. In this case, loyalty to the monarch and his wife was not displayed by having their badges adorning the place. It was through constructing a whole new wing purely for them, and to ensure it was decked out with the latest continental designs and full of sumptuous luxury items. Starkey told the audience that despite all the things he was taught at Cambridge regarding the Reformation – about the social movements allegedly inspired it, the impact of the printing press, etc – he believes that, fundamentally, the break from Rome only happened because Henry fell out of ‘luuvv’ (as he said it!) with Katherine of Aragon and in ‘luuvv’ with Anne Boleyn. So for Starkey, and he was very frank about this, Anne was a most remarkable figure. She was, he argued, an ‘amazing effective mistress’ – the most important royal mistress in history. Additionally she was remarkable because she became Queen due to love. She was tenacious and he denies that she was a mere floozy (though he still thought she could be called a floozy!) She was a dedicated religious reformer, greatly inspired by the French evangelical movement. 1535, Starkey reminded us, was the first time Henry went outside of London to promote the reformation. Anne, the committed reformer, visited the households of a number of pro-Reformers during this trip alongside her husband. Starkey once again showed the portrait of Sir Nicholas Poyntz and asked the audience what they thought of his dress. A few immediately replied that he looked French, and Starkey agreed. Sir Nicholas has modelled himself on a French gentleman, and who else was rather French in their ways? Anne Boleyn, of course. Starkey emphasised the role Anne played in promoting all things French. The implication here was that courtier Sir Nicholas, who certainly wanted to better himself, was very keen on emphasising his fidelity to both his king and queen. Anne may have been disliked by many, but Sir Nicholas was very keen to gain her approval. In fact, Poyntz understood that there was the need to win the hearts and minds of the people to Anne. So he supports the royal progress by remodelling his house to accommodate both her and the King. And this remodelling is remarkable. In such a short space of time he has a complete wing built. Its build so rapidly that it lacks foundations. The rooms are built in the fashion of Hampton Court. In short, Henry and Anne were made to feel at home. Why did Henry and Anne go to Acton though? Why, on their tour, did they also stay with the Walshs at Little Sodbury (situated close by). The simple answer, Starkey says, is that these people were reformers. The Walshs had once hired William Tyndale as a tutor to their children. Sir Nicholas was also interested in religious reform. And the area had a well established history of being connected to dissenting views (like Lollardy). Hugh Latimer, who Anne offered patronage to, became bishop of Gloucester. Finally, Starkey remarked that Acton Court was a snap shot in time. It was, in essence the 1535 Royal Progress and it is remarkable that it survived. He sees it is the equivalent of the palace built for the Field of Cloth of Gold, except unlike the palace it was a temporary structure never demolished once used. Someone asked about Sir Nicholas Poyntz’s connection to Anne Boleyn. Starkey replied that Poyntz came from a court family. In fact his grandfather had once been vice-chamberlain to Katherine of Aragon. So did Anne wish to win Poyntz over? He was also well connected to other reformers, like the Walshs and as explained he came from an area with a history of being pro-reform in variable degrees. He was also asked what happened to the wing of the house after Henry and Anne visited. Starkey replied that we simply don’t know. He speculated that it was never used by the family – so became a kind of state room to commemorate the King’s stay. One woman asked why there is so much recent interest in the Reformation. Starkey said this was a good point, and said it perhaps has to do with the religious tensions of our age. He then discussed the current state of Islam, speculating whether it is approaching its own reformation. He also implied there was a fear of religion at the moment. Another person asked about the wall paintings in Acton Court. Are they significant? Starkey replied they absolutely were and showed the impact of the Renaissance namely ideas in art from France and Italy. He noted that Anne Boleyn was very familiar with French art and would have found the designs familiar. Overall Starkey talked about the Renaissance in a national context. Finally(! ), someone asked whether Anne Boleyn’s downfall was connected to the Poyntz’s own demise. Starkey answered that this was not the case; the family declined years afterwards (as did many gentry families). He did end by saying that Henry never revisited Acton though this was due to many factors like the King getting older and having numerous affairs to deal with elsewhere. Anne’s death though did not mean her supporters also suffered. Overall an interesting talk. I enjoyed Starkey’s emphasis on Acton Court representing a moment frozen in time and we are fortunate, as Anne enthusiasts, that she shared in that moment. Oh, and I think we can guess about Starkey’s views regarding the recent attempts to dig up Henry VIII. He noted that the royal loo used by Henry still survives at Acton and wry noted that scientists can probably dig around in there and get his DNA if they like. Meow! Thanks for sharing your notes, Nasim, and how wonderful to hear David Starkey speak! Nasim told me how there are currently fears that Acton Court will fall into ruin because of the heavy traffic on the road outside it. At the David Starkey talk people were signing a petition to reduce the number of lorries allowed on the narrow country lane outside Acton, to try and prevent further damage to this wonderful Tudor building. Nasim is from the area and says that many of the lorries do not need to use the road and are just using it as a shortcut, not realising that their actions are causing damage to the building which stands just three feet away from the road. « Should Historical Fiction Have a Warning Label? Thank you, Nasim, for a wonderful artiicle about Acton Court. I didn’t know about this place and its connection to Anne and Henry. I do hope it can be saved! I ‘liked’ the save it page. Here in the States, we lose old houses and buildings all the time—torn down to make way for whatever…parking lots, strip malls. It is so sad. You are very lucky to have such old places! Just think of how long this building has struggled to exist….it would be a shame for a piece of Tudor history to be allowed to fall down when it could be saved…We are talking 500 years…none of the homes built during our times ever last that long…I sincerely hope that action is already in the process for saving this landmark…Just to think that King Henry VIII was actually here, isn’t that enough to save it. How about the Queen of England, surely she wants this house maintained…..wouldn’t she??? Wasn’t the grandmother of Sir Nicholas Poyntz, Margaret Woodville, who was married to Sir Robert Poyntz, the vice chamberlain of Katherine of Aragon? She was the daughter of Sir Anthony Woodville who was the brother of Elizabeth Woodville, mother of Elizabeth of York, Henry VIII’s mother? Would that make his grandmother the first cousin of Elizabeth of York, & therefore, would not Sir Nicholas be a third cousin of Henry VIII? I recently heard that it was some time during 1535 that there are the first indications that Henry was falling out of love with Anne and she had her first ding dong with Cromwell. If that was the case why would he want to get her active imput into the reforms and spend such an obviously public role in making sure that Henry’s will is being implemented up and down the country as these progresses often did. They were not merely pleasure visits although a great deal of fun was had hunting and feasting during them; they were also affirmations of the royal power and will. A sort of I am just dropping in to make sure you are following my orders and everything in this part of the country is as it should be. But of course you are in favour at the moment so I have decided to stay with you for a night or two; and as with Elizabeth, if I bring my entire court with me, bankrupt you in the process. This progress was also to inspect some of the religious orders in the area and to note what reforms were needed. Anne was keen not to close the monastic houses but to encourage reform. They probably wondered what this woman was doing giving them orders and advice when they should only be taking it from their bishop or abbot. I am certain it was smiles and nods all around, but when Anne and Henry got back to the capital the real work began. There also seems to have been rumours before this progress that Henry had a more serious mistress than before and Anne had her removed from court. She had also suffered a miscarriage early in the year, which had made her less secure, By the time the progress happened they were clearly reconciled and when they came back it was obvious to all that they were close again. I believe it was during this progress that Anne conceived the son she sadly lost in January the following year. What a twist that a progress that had been a personal and public triumph for both Anne as well as Henry led to her greatest tragedy, and to her demise. BanditQueen, I don’t think there was any evidence or anything really that could lead to a probable cause to believe there was any trouble in the marriage especially in 1535. Of course, any and every marriage can have ups and downs. Or it could have been nothing more than their strongwilled personalities arguing and ending in passion that night forgotten but passed on from clever, wishful thinking servants for coins to be construed more than it ever was. In actuality, the fact that Acton showed such public support for Anne in this way should be enough evidence to show Anne was not in any disfavor. And if you really want to get technical there was actually no solid evidence supporting any breakdown in the marriage even in the end. The only documenting “proof” are Chapyuis letters referring to his information from his “credible sources”that are rarely ever named and the comment regarding what Cromwell said and supposedly hinted at. In fact, if you really think about it in April 1536 (x1 month prior to her demise) Henry was still avidly supporting Anne with parliament , tricking and making chapyuis recognize Anne as Queen (therefore forcing the Emporor to acknowledge her) and even wrote letters in that same month to his ambassadors of venice, Italy and France speaking highly of his “entirely beloved Queen” and was sure and hopeful and looking forward to a male heir by his “beloved Anne”. Honestly, had none of us knew the fate Anne suffered and only studied their marriage we would never have been alarmed by negative arising between the two of them. The only documented “proof” there was ever trouble in their marriage at all is through Chapyuis and his reporting of supposedly what cromwell, carew, Jane etc were doing and saying. None of it is reliabale and what truth there may be in his letters appear heavily exaggerated. Also, all these other oitragous claims regarding Anne come from,the chronicles of wriosley, Spain and a few others. Have you ever read the original sources of the chronicles ??? Well, I suggest you give it a try because you will be absolutely appalled at what you read. They ALL conflict with each other some from one spectrum to an entire different spectrum and are so “flighty” and i couldn’t believe how they were. They reminded me of the Enquire magazine only 10 x WORSE if that’s possible. Google “primary sources for Anne boleyn” and,see what you can come up with and read these biased, court hacked and gossip chronicles that we unfortunately have relied upon for information about Anne just wrestles my heart. I have learned after reading these original state letters and chronicles and so forth (also comparing them and knowing the actual source whether they be biased or not) has made me delve so much deeper in the Anne that we have not given any credit or justice for. Her story has just been,copied and passed down from generation to generation . Even Weir, starkey, (especially gregory) undermine Anne’s true image. They all claim to take the sources in account with biases yet are all guilty of their own biase and then cite the very biase they warn you of. The fact of the matter is Anne’s true image is distorted and their are so many rumors and untrue information passed around over and over. For example, Anne dressed in yellow for Catherine death… Wrong. No, only Henry was reported to have dressed in yellow. The rumor that yellow was sign of respect for mourning in Spain originated from one of the outrageous chronicles that stated that So then here you have all your historians and authors copying this from century to century never inquiring or thinking that maybe (just maybe) since all the other information on the chronicle is OUTLANDISH that maybe this yellow apparel for mourning might also be false????. Chapyuis actually debunks this myth all by himself by reporting in his letter to home regarding Catherine’s death that he was offered “black mourning clothes” for her funeral however he declined because she was not to buried as a Queen but dowager princess. He was obviously Spanish so he would have sought his and her own colors as a sign of respect has that been the case. Anyhow, my point is that So much information about Anne is false or highly speculative. I will check again also but the only mention of Henry and a mistress (or serious mistress) prior to Jane was only mentioned once by Chapyuis and was mentioned again?? Im, sorry I just can’t go by that and believe it to be true just because Chapyuis says it happened. Maybe he wanted it to happen… Another myth. That Henry was highly disappointed with Elizabeth’s birth which is FALSE. He may have been hoping for a male but a healthy, baby girl would not have been a blow to Henry espcially for Anne’s first pregnancy. Miscarriages, babies and mother’s death was quite apparent and common during this time and I just dont see Henry being this outrageous monster (at that time) and blaming Anne for the healthy baby girl??? Henry had one child after 2 decades of marriage and I’m sure he would have been relieved to know Anne could bear healthy children as evidence by her first pregnancy and healthy birth. What proof do we have that he was ever dissatisfied with Anne because of this??? None. Sure they had higher hopes for a boy but always demeaning this moment in history as the turning point in their marriage is just absurd. Henry avidly defended Anne throughout their entire marriage believe it or not by the acts of parliament and enforcing them. He nearly “murdered” his fool for going to far commenting about Anne. Bottom line. There is no proof their marriage suffered any in the beginning . My personal opinion and is also just speculation like everyone’s else is that something did happen between Anne and Henry private. Henry and Anne were both strong willed and “stubborn” and Henry was paranoid and jealous to go along with that. Maybe Anne was jealous of Jane when she found out and did say hurtful things and things escalated from there with Henry. I think Henry was easily swayed by Anne’s enemies and Cromwell moved quickly so Henry didn’t have time to change his mind lAter. Surely , though tyrant still surely thought and regretted annes death until the day he died. Thank you for your comments but I don’t need to Google contemporary sources for Anne Boleyn because as a historian I have access to contemporary sources, but yes there are a number on the internet. This site is also an excellent resource. There is evidence that Anne was under strain before 1535 and that her marriage to Henry was having problems because of her arguments with him in public over his temporary affairs. There is also evidence that Anne had made remarks that she would order the execution of Katherine of Aragon and Princess Mary if Henry left her as regent. Anne also complained that she may not have another child while they lived and she made erratic threats about them. We know this because her brother George Boleyn had to tell her several times not to be so foolish. Anne also made remarks at a banquet for the visit of the Ambassador from France that Henry was talking to pretty women and had forgotten her. A confrontation resulted in him telling her that he could put her down from her Queenly State, just as quickly as he raised her up. There are numerous examples of turbulence during 1534 and 1535, partly due to her lack of a son, partly due to her hands on approach to Queenship. That doesn’t mean that they were not also shown as merry and in love and in December 1534 up to that Summer there is some evidence that Anne carried a child up to her seventh month and yes, indeed, Henry defended Anne and their marriage, demanding in fact that she was recognised as his lawful wife as late as Easter 1536. Anne and Henry are described as merry together, more than all of his other wives, but that doesn’t mean they didn’t have their problems. Nor does it mean that they were not working hard to advance their marriage, reforms and produce an heir. Something, however, was preventing Anne conceiving after what appeared to be a late term miscarriage. (Some historians are of the opinion her pregnancy in 1534 was a phantom pregnancy but other evidence and a potential portrait of Anne in the Blue Book of the Garter indicates that she was). Anne was widely reported as criticising Henry over other women and they had public rows which are noted by Chapuys and others. He does correct himself at a later point and he doesn’t seem to say Henry wanted out of his marriage and I agree that wasn’t the case during their first two years of marriage, but it was now a relationship of “sunshine and storms” and people noticed. Henry still valued Anne’s opinion at this point as well and we know she had an impact on his on going new ideas of monarchy, she had an impact on his religious changes and she helped him redesign the old York Place into the Palace of Whitehall. Henry was looking for a marriage for Elizabeth and he allowed Anne to discipline Mary because she refused her as Queen. Anne is often blamed for the poor treatment of Mary in her daughter’s household and yes, she gave orders regarding this, but Henry was King and Anne was acting with his approval. Mary was threatened with much worse after Anne’s death. The visit to Acton Court was part of a long term strategic promotional campaign of the Supremacy and the future of the religious houses and to bring on side families who could be relied upon to support Anne and Henry’s ideas. The progress was part of that and it was a celebration of what they had achieved and hoped to achieve through the son they both still hoped for. By the end of the progress Anne was carrying Henry’s son, but the progress had seen them happier than they had been for some time and in a triumphant mood.